Few cities leave as strong of an impression as New York, and New York yoga studios uphold that unique identity. If you're in search of a new yoga studio, "The Five Boroughs" have much to offer. Excel Yoga Dance and Fitness offers a number of yoga classes at various levels, including gentle yoga and kids' yoga. There are a variety of workshops in meditation, numerology and more. 3045 Buhre Ave (off Westchester Ave.) Bronx, NY 10461. (347) 281-9700. Greenhouse Holistic is a full-service wellness center. In addition to Ashtanga and Vinyasa yoga classes, the center offers Pilates, T'ai Chi, belly dancing, bodywork, and acupuncture. Special monthly membership packages are a real treat: unlimited yoga, Pilates, and belly dancing classes, plus use of the sauna and discounts off other services. There are multiple locations, check this contact page for the Brooklyn studio nearest you. Jaya Yoga Center concentrates on Hatha yoga for practitioners of all levels. Offset workshops explore certain asanas more deeply. 1626 8th Ave., Brooklyn, NY 11215 (718)788-8788. The Breathing Project is a combination yoga studio and educational center. The organization stresses the importance of breathing in "posture, movement, health, and well-being." 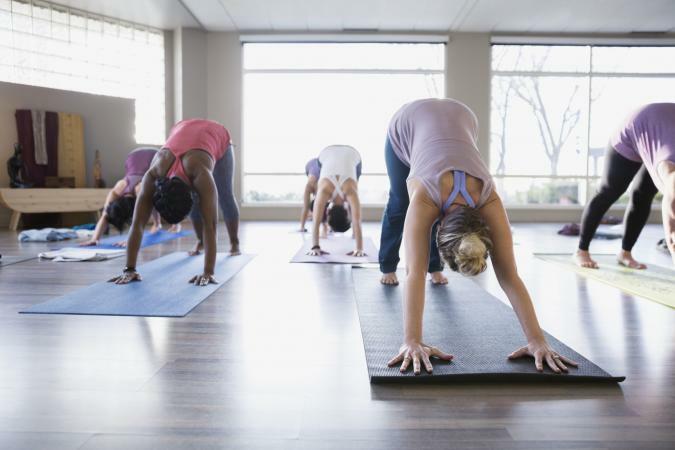 In addition to yoga classes such as "Yoga and Mental Health," restorative yoga and "Yoga Mom, Buddha Baby," The Breathing Project offers wellness seminars, workshops and training programs. 15 W. 26th St., 10th floor, New York, NY 10011 (212) 979-9642. Dharma Yoga Center is led by Sri Dharma Mittra, a teacher who has been involved in New York yoga since the 1960s. Mittra and the center's other instructors specialize in various levels of Hatha Raja yoga, gentle Hatha yoga and purification classes. Dharma Yoga Center is a teaching facility as well. 297 Third Ave. at 23rd St., New York, NY 10010 (212) 889-8160. The Integral Yoga Institute is a comprehensive mind-body-spirit studio. They have a variety of yoga classes, particularly Hatha yoga, as well as meditation and spiritual awareness classes and workshops. Their daily class schedule can be found online. 227 West 13th St., New York, NY 10011 (212) 929-0586. With a name like Laughing Lotus, it has to be good. An upbeat and funky yoga studio, Laughing Lotus has a range of yoga classes, styles and times, such as the "early bird" 75-minute session, a challenging "Cosmic Play" Vinyasa yoga class at nearly two hours, and the 10 p.m.-midnight yoga event every Friday with live music. Attendees can register for classes online. 59 West 19th St., third floor, just off 6th Ave., New York, NY 10011 (212) 414-2903. Genesis Tree of Life Yoga and Wellness is "yoga and wellness in the Himalayan tradition in the heart of Queens." This studio's expertise expands into many areas, including the science of yoga, pranayama, meditation, Kundalini, and Tantra yoga, as well as a variety of dance programs and fitness training. 102-19 Metropolitan Ave., Forest Hills, NY 11375 (718) 544-5997. Yoga Works has six locations in the Big Apple, as well as centers in Orange County and Northern California, and Chicago. The center offers a wide range of classes, including specialized programs for kids. Yoga Works also has workshops, retreats, and teacher training. If you have a deeper interest in Bikram yoga, there are more than 10 centers in New York. Go to the Bikram's Yoga College of India site and click on "class finder." In this article, we've pointed the compass to merely a fraction of the New York yoga studios available. If you'd like to stay current with yoga happenings in the big city, visit Yoga City NYC.